With the summer upon us and the school holidays are about to start and so is summer wedding season. I thought i'd put together some outfit ideas for him and her. I love dressing up for a wedding, it's an excuse to go and and buy and whole new outfit. I picked out some pretty summery dresses. 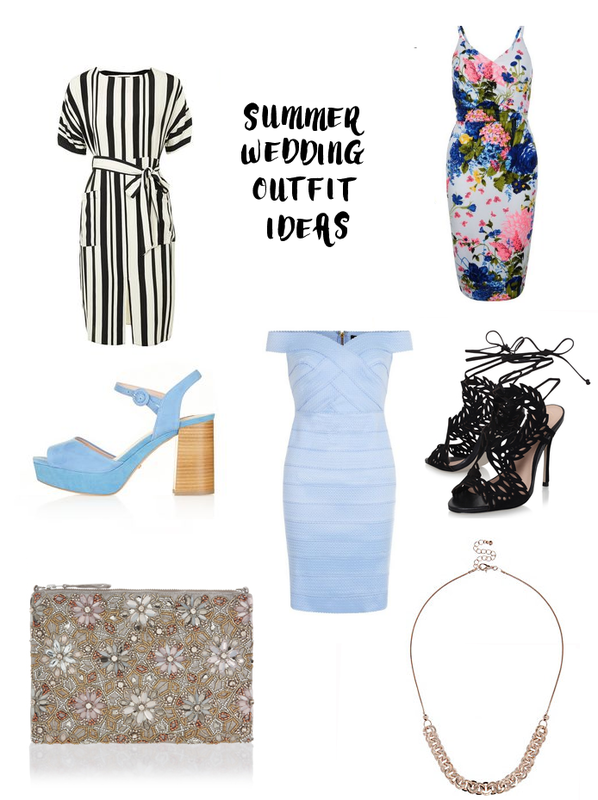 Pastels are always a good shout for a summer wedding. This pretty floral dress from New Look is a gorgeous print and a really pretty colour. I find bodycon styles like this are really flattering on me as I have an hourglass figure. These pale blue shoes from Topshop are so pretty, I love the colour and the wooden heel is lovely, I think they would be really comfy, perfect for a wedding. I picked out this stripe dress from Topshop which is a lovely shape, I am a huge fan of stripes. I'd wear this with these gorgeous strappy sandals from Kurt Geiger, these are such a stunning pair of sandals which you could wear time after time. I love this embellished bag from Accessorize, it's perfect for the summer wedding/ prom season. 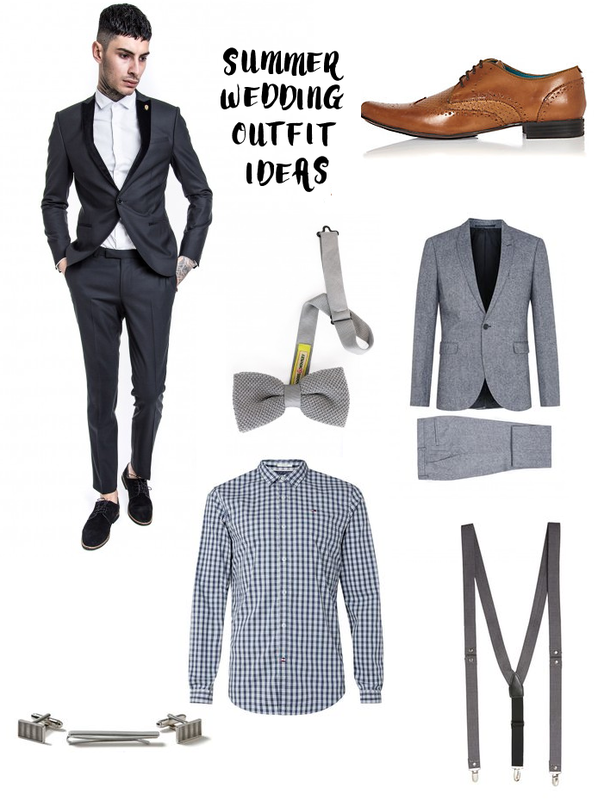 When it comes down to outfits for mens for weddings it's all about that perfect suit. There's some really lovely suits out there so I thought i'd share some inspiration with you. This Noose and Monkey suit is a really classic style I love the contrasting Velvet Lapel and I love the skinny fit of the jacket. It's a really nice quality suit that would be perfect for any occasion. Noose and Monkey have some really unique suits and shirts so check out their SS16 lookbook here to see their latest styles. I'm a sucker for a grey suit, this one from Topman would look fab with a nice skinny fit shirt and a grey bow tie like this one from Noose and Monkey. A pair of brown/ tan brogues are a great staple for any summer occasion, you can pop them on with any colour suit and they look smart but trendy. I really like brogues and think they are a classic style. I love a check shirt, with a nice blazer to dress it up or on its own with jeans/ or trousers and some braces for a more casual occasion.